Today is a special day at our house: it's my husband's birthday. Obviously, we were only 12 years old. Seriously, I never would have thought that 30 years could pass so quickly. So many milestones celebrated together. For 30 years now we've been together for every birthday, every holiday, every celebration. So much to celebrate together! And for 30 years now we've been together for every bad day, every argument, every illness, every death. So much to suffer together! Because both the good and the bad are part of life together: the happy and the sad, the peaceful and the angry, the elated and the devastated. Little girls like fairy tales, most of which begin with "Once upon a time" and end with "they lived happily ever after." Unfortunately, many of us grow up without realizing that real life can't be a fairy tale--not even if we have a handsome prince. "Happily ever after" isn't reality. But today, on my dear husband's birthday, I'm thinking that "happily ever after" is close to the truth of a good marriage. Change one little letter and you've got the secret. How about this? "They lived happily even after." In marriage we pledge to love and to cherish one another "for better, for worse, for richer, for poorer, in sickness and health." Perhaps you've heard the old joke that goes, "I took her for better or for worse, but she's worse than I ever took her for." Yes. Well, aren't we all? But by God's grace, we can live happily even after. After sickness, after poverty, after worse difficulties than we ever imagined. Even after whatever comes our way, whatever we stumble into, and whatever we bring upon ourselves, we can live happily. It's not just another fairy tale. For we "can do all things through Christ who strengthens us" (Philippians 4:13). Are you living happily even after? What God hath joined together. . .
and through "Grace" each one has brought us closer one to the other. Richella congrats and I wish you both many more happy years together...err...happily ever after!!! Yes, life is like that, just as you mention it, but yes, it is a happily ever after situation for us too, after 40 years...almost 41 now, we are so blessed, aren't we?! May God bless you both amply. I love this. Such a beautiful post. I am going to copy and paste to my documents so that I remember it. Happy Birthday to your hubby and yes, you are right. The scars are all part of the even after. We have survived and loved for almost 32 years. That's a lot of growing together. Happy Birthday to Hubby! 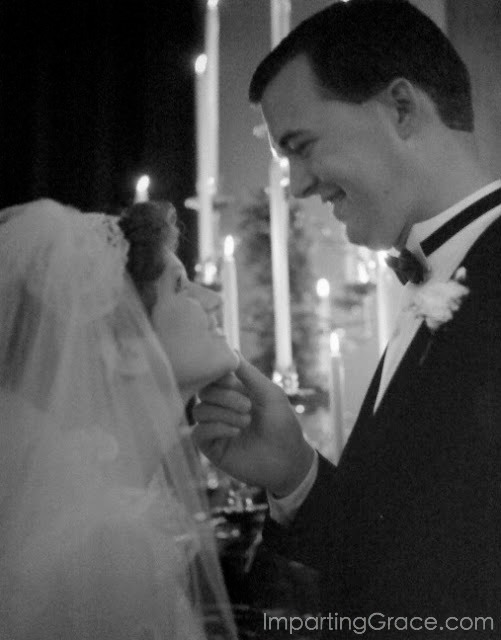 May you have 30 more years together! Richella, Happy Winter to you; seems like it's been forever since I popped in. What a powerful post today and I'm thankful that you weren't bearing bad news. You are right, I grew up with unrealistic expectations of marriage and life with a husband. I grew up in the Leave It To Beaver era and I think that fueled many false hope with young girls. Wouldn't trade my man for anything, but wish I would have known what marriage was all about. I found you through someone's Thursday link up. I'm a sucker for marriage posts and I love this one. I so love the spin you put on: Happily "even" after. I really like your blog. I have a feeling I'll be back! Hi Richella, Happy Anniversary! As for happily-ever-after, sometimes not-so-happy but we are called to be joyful. Our marriages are to be a picture of Christ and the church according to Ephesians. It is sometimes quite messy and hard but how we walk through it is always a testimony to the world around us. I think I will tuck your 'happy even after' away for use in the future as we counsel young couples just starting on the journey. May you see many more blessed years of marriage.